The Transcendental Aircraft Corporation, a small company, put the final touches to an aircraft designed and built by Mario A. Guerierri. This prototype, known as the Model 1G, is a single-seater convertible helicopter with two contra-rotating rotors located at the end of its wings. These three-bladed rotors act as normal helicopter rotors, but they can also be swivelled forward to become the traction airscrews of a typical aircraft, lift then being provided by the fixed wings. Thanks to contracts signed with the U.S. Air Force in 1952 and 1953, the Transcendental Aircraft Corporation was able to solve a number of problems, and more particularly that of instability pheno-mena occurring when the rotors are swivelled forward. Since'a helicopter rotor behaves differently from a conventional air-screw, a compromise had to be worked out. The engine reduction has been replaced by a two-gear reduction box, at the exit of which a gearing system has been attached which enables the rotors to be put into auto-rotation. At the engine's maximum output of 3000 r.p.m. the rotors rotate at 633 r.p.m. as airscrews, and at 240 r.p.m. as helicopter rotors. Three concentric tubes start from the swivelling device, the first of which moves the rotor, the second controls cyclic variation and the third variation of collective pitch. The time needed to move from the helicopter to the aircraft position is roughly three minutes. In this change-over, the rotors swivel through an angle of 82�. Model 1G flew for the first time as a helicopter in June 1954 and as a convertible in December 1954. This aircraft is still in the developmental stage. Also a convertible, and an extrapolation of Model 1G, it is intended to be powered by two gas turbines, and to accommodate a crew of two and also six passengers or alternatively four stretchers. It is expected that this model will have a cruising speed comparable to that of a traditional aircraft and also the special take-off and landing properties of a helicopter. Illustrated above is the Transcendental Aircraft Corporation's latest tilting-rotor convertiplane prototype, designated Model 2. The first machine suffered ground resonance and was destroyed in 1950. A further machine, the 1-G, was built for ground testing, then modified for flight under U.S.A.F. contract. During 1954 and 1955 it made more than 100 flights and achieved 90% conversion (about 70� forward rotor tilt), before failure of the friction lock on the collective-pitch lever caused a forced landing in the River Delaware. The Model 2 has more power and greater wing-area and should make its first flight early next year. It is powered by a Lycoming O-435-23 of 250hp and weighs 1020kg. Useful load is 300kg. The Transcendental Aircraft Corporation of Glen Riddle, Pennsylvania, was the first company to claim flying a successful Tilt Rotor aircraft. 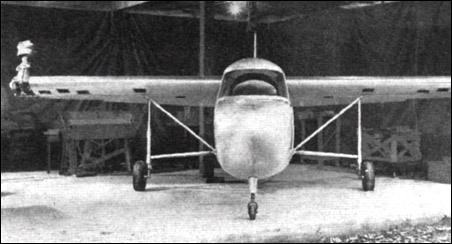 The Model 1-G was a small, high-wing experimental aircraft with a fuselage-mounted engine and fixed tricycle landing gear. The single pilot sat forward of the wing in a semi-enclosed fuselage. The clear plastic nose gave the pilot helicopter-like visibility. A single Lycoming 0-290-A six cylinder engine produced 160 horsepower. The fuselage measured 7.9m long, and the aluminum wing measured 6.4m. The ailerons were fabric covered. Empty weight was 655kg and take-off weight was 790kg. The projected maximum speed in helicopter mode was 190km/h, and 260km/h in airplane mode. A 5.2-meter diameter, three-bladed, fully articulated rotor was mounted at each wing tip. The rotor shafts tilted from pointing vertically for hover down to 6 degrees up from horizontal for forward flight. Electric motors controlled the tilt of the rotor shafts. Interconnecting shafts ensured that both rotors maintained the same tilt angle. Each rotor was driven through a two-speed gearbox. This allowed the pilot to lower the rotor rotation speed for more efficient cruise in forward flight. Although the Model 1-G was a private development, the Wright Air Development Center at Wright-Patterson AFB issued contracts to study many of the Tilt Rotor's unique peculiarities. The first was awarded in 1952 to investigate the dynamics and structural characteristics of the rotor system. The Air Force awarded a second contract in 1953 to investigate mechanical instability problems associated with tilting the rotors. The first hover flight was either on June 15 or July 6, 1954 (references vary). The first forward flight in hover mode occurred on December 13, 1954, and the first forward flight with rotors tilted occurred only four days later. By April 1955, conversions with the rotors tilted up to 35 degrees from vertical were completed. Eventually, the Model 1-G completed numerous transitions up to 70 degrees of tilt with the wings sustaining over 90 percent of the weight. The Model 1-G was destroyed during a test flight on July 20, 1955. After performing a virtually complete conversion, the friction lock on the collective pitch controller slipped, throwing the aircraft into an abrupt, steep dive. The pilot initiated a recovery, but there was not enough altitude to complete the pull-up before contacting the Delaware River. The aircraft flipped on its back, resulting in irreparable damage. During the Model 1-G's brief career, it made over 100 flights and flew 60 hours. It demonstrated excellent controllability without vibration, and reached an altitude of 1060m and an airspeed of 185km/h in helicopter mode. A second aircraft, called the Model 2, was to fly in late 1956. Transcendental received an Air Force contract in March 1956 and completed the Model 2 in October. Compared to the Model 1-G, it was stronger and more aerodynamic, but had the same basic configuration. The enclosed cockpit had side-by-side seating. Power was by one 250 horsepower Lycoming O-435-23 six cylinder engine. The wing was a 0.3m longer, but the fuselage was 1.2m shorter. Empty and gross weights were 708kg and 1015kg. Development ended when funding from Wright Air Development Center stopped. It could not be determined if the aircraft ever flew, and eventually it was dismantled. The aircraft flipped on its back, resulting in irreparable damage.